Preschoolers discover the world as they gain confidence and independence in a joyful, hands-on, bilingual learning environment. Curiosity, wonder and exploration abound in our classrooms, where English and Mandarin teachers work in teams to create a joyful, hands-on learning environment. In our inquiry-based approach to learning, children actively participate, investigate and experiment to find out about the world. Teachers support children’s interests through meaningful and authentic experiences. 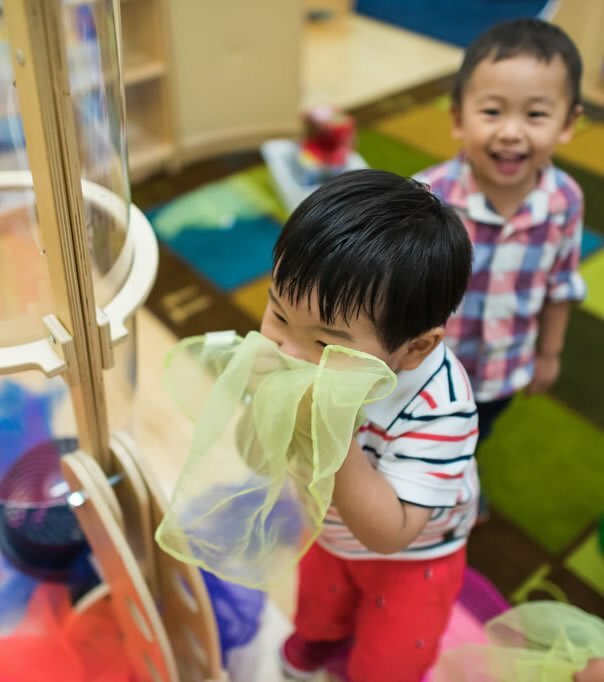 With a wide variety of multi-sensory learning resources, including open-ended materials, children’s imaginations soar while they build skills and knowledge across all learning areas. Our outdoor play areas and indoor gym provide ample space for getting out, moving around and exploring. Our whole child approach fosters children’s confidence and independence in all areas of development, providing students with a strong foundation for a lifetime of learning and future participation as citizens of the world. As children’s minds grow, so do their hearts. Preschoolers learn what it means to be a friend, to include others, to share and to collaborate. Through modeling, guidance, discussion and giving students opportunities to practice, teachers support children to grow in empathy and gain appropriate skills to negotiate conflicts and to manage their own feelings and actions. Preschoolers also gain autonomy and independence by learning to manage age-appropriate tasks on a daily basis. The preschool is open from 8:00am to 6:00pm with some children leaving at noon, others at 3:30pm and others staying all day. Preschool children are grouped together by age. The daily schedule is modified for the needs of the age group with a longer naptime for our youngest students. 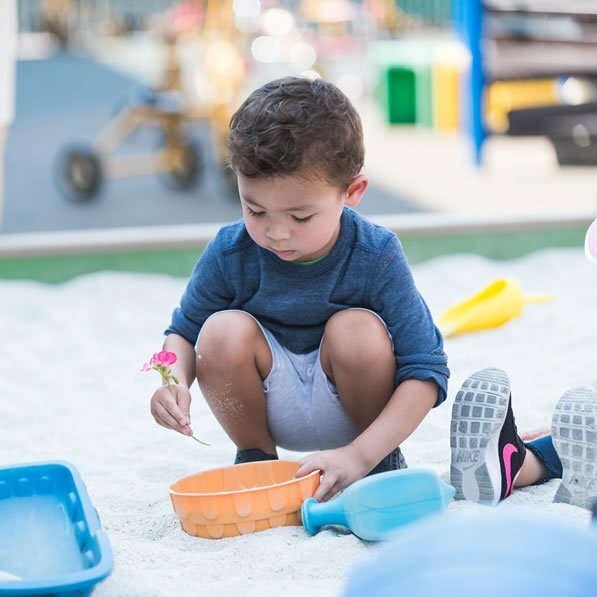 A typical preschool day will include a mix of free choice time, outdoor play and small group activities as well as whole group circle times in Mandarin and English. Nutritious snacks are provided daily. Parents send lunch with their child or purchase lunch through the school’s designated catering service. Our bilingual preschool program takes place in a nurturing environment that enables children to exercise initiative, make decisions and construct a hands-on understanding of the world through two languages, English and Mandarin. An integrated curriculum based on children’s interests comprises learning activities covering a range of areas rather than isolated subjects to further children’s learning and development. Learning experiences are carefully planned to be culturally, developmentally, educationally and individually appropriate. The best of Western and Eastern teaching approaches are combined with a focus on the process of learning rather than the product. Developing creativity, cooperative learning, investigation and problem-solving skills is an important component of the program. 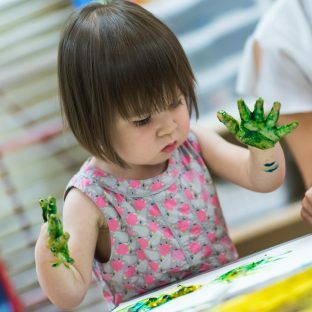 Development Matters in the Early Years Foundation Stage of the United Kingdom and the California Preschool Learning Foundations provide practice guidance for our preschool teachers. YCIS’s Co-Teaching Model is a unique feature in our educational approach. English and Mandarin co-teachers work together to create a joyful, nurturing and engaging bilingual learning environment for children. They share equal responsibilities for the care and education of their students. Through close collaboration, co-teachers build welcoming and inclusive classrooms where diversity is respected and everyone is a friend. Each preschool classroom has a Co-Teaching Team with one English-speaking teacher and one Mandarin-speaking teacher, and is supported by a fully qualified assistant teacher. Teachers each speak their native language with their students. Group activities such as circle times alternate between English and Mandarin. YCIS Silicon Valley’s preschool teachers are all experienced, professionally trained early childhood educators. They are passionate about teaching and engage in regular professional development. Working as a team, the preschool teachers’ enthusiasm, care and warmth shine through in their classrooms and in their relationships with the children and families they serve. Our inquiry-based learning approach starts with children’s interests and natural curiosity about the world around them. Preschoolers love to ask questions, problem solve and discuss. Teachers pay close attention to the questions children ask. They have conversations and discussions. They watch and engage with children as they play and explore. Then, they design activities and experiences to help children dig deeper into their interests and challenge their learning. It is not unusual to see a classroom transform into a jungle, a doctor’s office or a pizza parlor. Teachers may organize field trips to extend learning beyond the classroom with a visit to a zoo or even invite an expert such as a NASA astronaut to visit. Teachers constantly monitor each child’s individual progress. They collaborate to document this progress in an individual student portfolio as well as through reports for parents twice annually. Children build their vocabularies and confidence in speaking through play and exploration while also building the fine motor skills they need to use writing tools effectively. By being challenged at their own level, children gain confidence in their growing abilities and build a strong foundation for the formal language instruction they will encounter in Kindergarten. For young children, school is their home away from home. We communicate with parents about their children’s school experiences in many ways. Teachers provide bi-weekly newsletters with photos and stories about class activities, create individual student portfolios to track each child’s development throughout the year, send home two student progress reports annually, and meet parents for parent-teacher conferences. Parents are also welcome to volunteer as room parents and chaperones for field trips, participate in class and school events, and support the community-building efforts of the YCIS Parent Organization. The Preschool program is designed to provide children with a positive start to their education and prepare them cognitively and socially for the more formal school environment they will encounter in elementary school. Preschool and Kindergarten teachers work closely together to plan and implement activities throughout the year to prepare children for a smooth transition to Kindergarten. During the school year, preschoolers visit the Kindergarten classrooms, enjoy meeting the Kindergarten teachers when they visit preschool, and participate in some events on the K-8 campus.